This is my card entry for the "My Creative Time Throwback Thursday Challenge #60". The Theme for this Challenge is "Animal". We were supposed to use the cartridge Zooballoo but I don't have that one. If we don't have the cartridge we are allowed to use what we have as long as it stays within the theme. This card is 5 1/2" X 4 1/4". 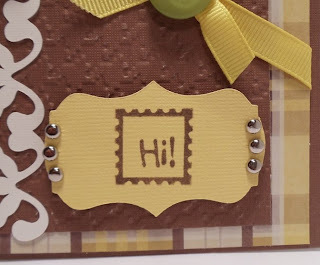 The Brown and yellow plaid background is 5 ¼ " X 4". 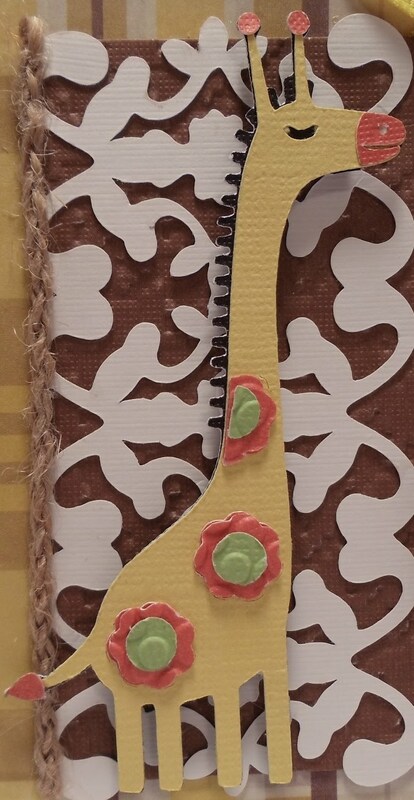 The Brown is 3 ½ “X 4”The white Lace is 2" X 3 ½ "and the inside yellow is 3 ¾” X 5 ¼”. The Cartridge I used is Paisley since I didn’t have Zooballoo. 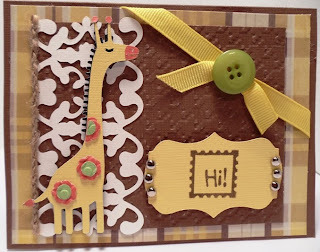 The Giraffe was cut at 1 ½” and the phrase “Hi” was cut 2 ½ ". 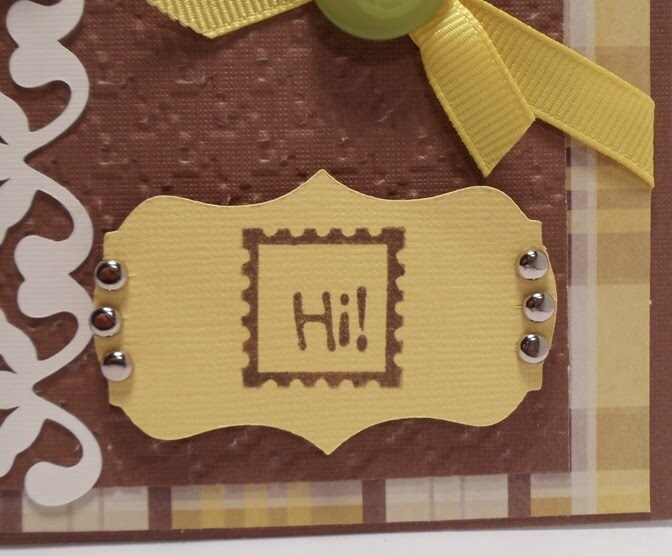 I then stamped the “Hi” on sign using a random stamp from the dollar rack at Michaels. Finally, I finished it off with a pretty bow and button embellishment and some silver brads on the sign. Hey there Miss Cricut Chick! Once again my friend, You did an AMAZING job w/the challenge! 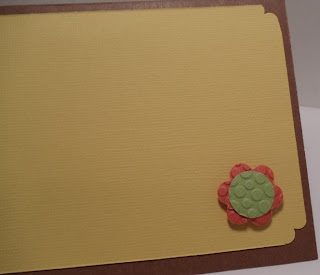 I just LOVE your card! Thank you sooo much for sharing your talent w/all of us for my throwback Thursday Challenges! awwww the flowers on the giraffe are so cute. you did a great job. WOW I love how you put the ribbon in the corner. Different, I likey. TFS. 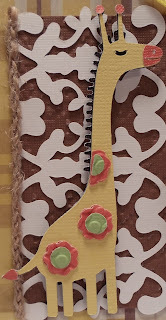 I just got my Paisley cartridge yesterday and have been looking for ideas to use it with. 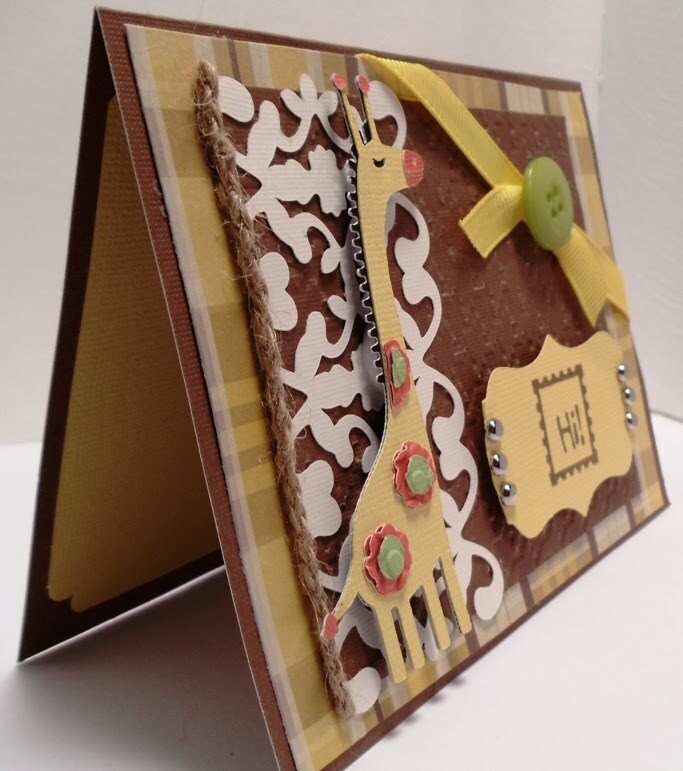 I love this giraffe card!